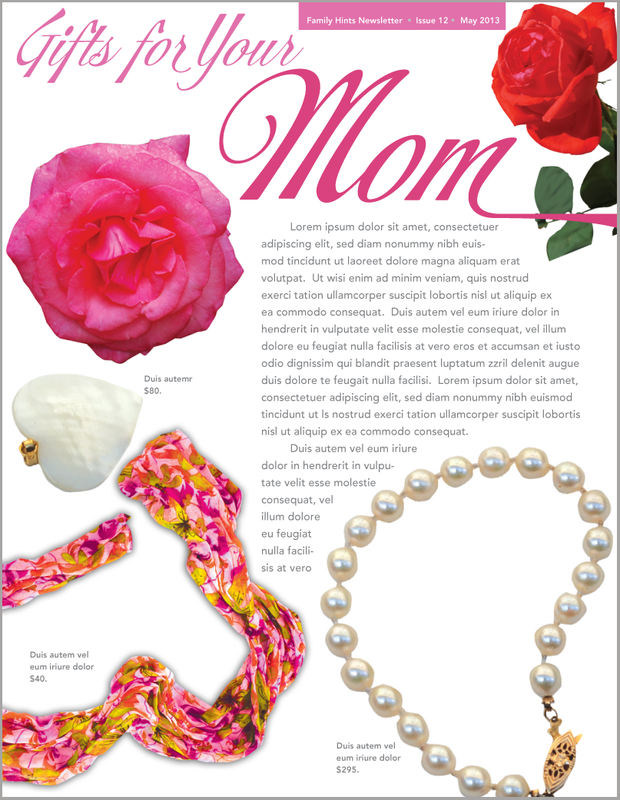 Any newsletter can look great when you feature an article on Mother’s Day. Flowers, jewelry, pretty blouses and scarfs are great items to showcase or to use simply as decorative elements. All you need is a camera, a computer, Adobe Photoshop and some artistic ingenuity. In this example, we took some close-up photos of the items. All shots were taken outdoors. Then we knocked out the backgrounds in Photoshop. We then added the typeface, Storefront, for the headline and wrapped the body text around the gifts and flowers. That’s all there is to it. In fewer than two hours you can have a great layout and mom will be happy too! This a great idea for newsletters on Mother’s Day, Valentine’s Day, women’s apparel, jewelry, women’s accessories or retail merchandising. This entry was posted in Newsletters and tagged design, Flower by Successful Corporate Communications. Bookmark the permalink.